There’s no question that risotto is amazing comfort food. Warm, hearty, and packed with cheese, it’s certainly hard to go wrong. Except that it takes a lot of time and effort—patiently standing and stirring over the stove for over and hour… there’s a reason why I don’t make risotto all too often. I was already planning on finally bringing out my little Crockpot for the season and brainstorming delicious slow-cooked recipes of stews, chili, and hearty soups. 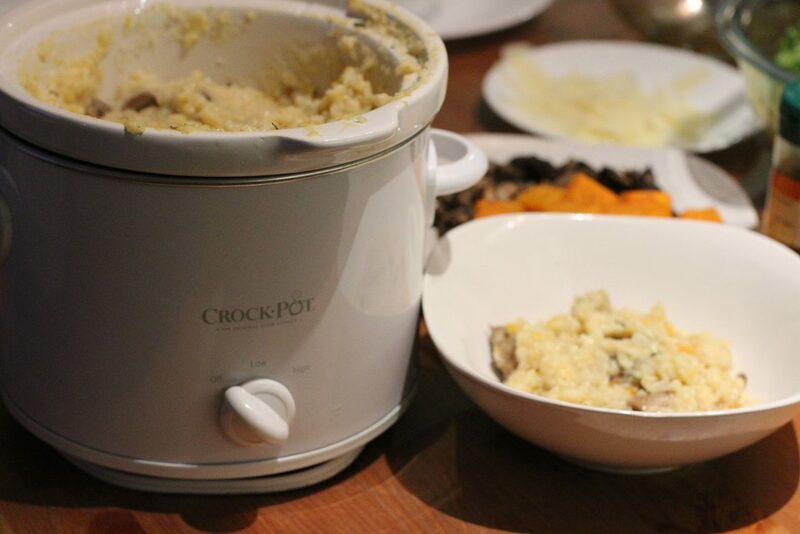 But then it dawned on me: risotto, in a Crockpot! Epiphanies were happening, a ladies night in was planned. 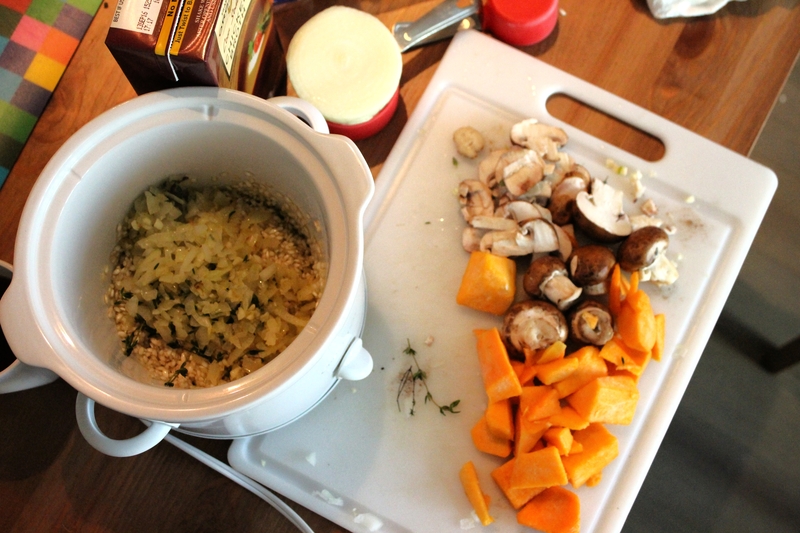 Before I knew it, I was in for preparing a Crockpot risotto filled with the fall-flavors of butternut squash and cremini mushrooms for a small group gathering! There’s a few things to note, one being the texture. Since it’s being slow-cooked for hours, it’s a little different from stove top risotto; the resulting rice is closer in consistency to a thick congee. But make no mistake, the flavors are all there, and I found myself as well as my guests coming back for a second helping! My recipe is perfect for a smaller gathering, or as a side dish to bring to a Thanksgiving gathering! I used a smaller Crockpot (2-Qt) but I am confident it will cook well in a larger Crockpot as well. Hope this provides some Crockpot recipe inspiration! What are some dishes and flavors that you’re planning on creating for Thanksgiving? Thanks for dropping by. 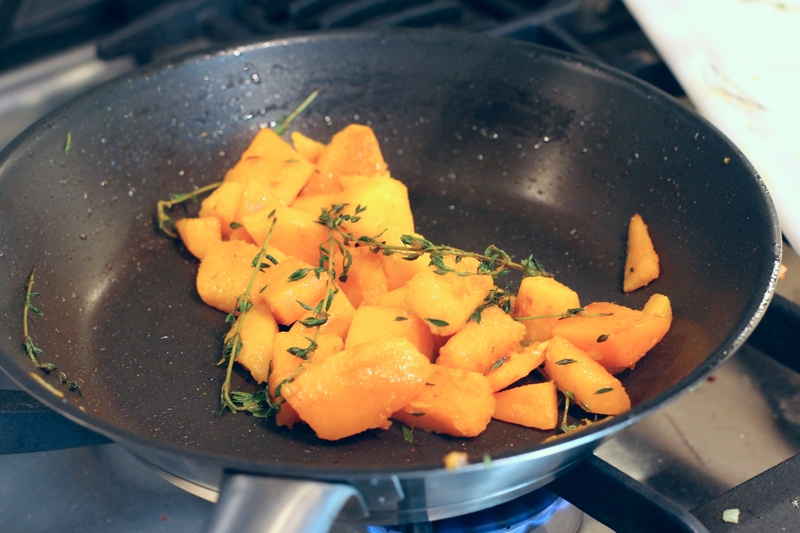 I still have more recipes to share so check back in tomorrow for another squash-centric Thanksgiving side dish idea! 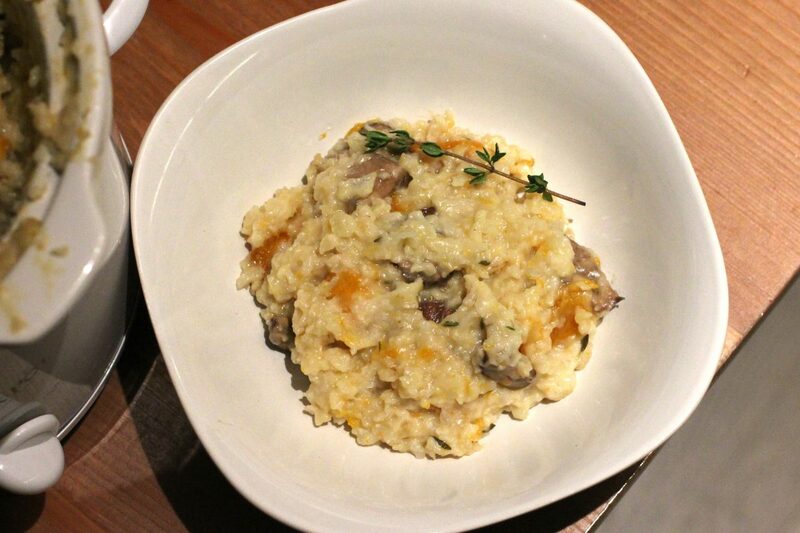 Easy and stir-free vegetarian risotto filled with butternut squash and mushrooms prepared with a Crockpot! Say goodbye to the endless stirring! Sautee diced onion, garlic, and a few sticks of thyme with 1 tbs olive oil over medium heat until browned and softened, about 3 minutes. 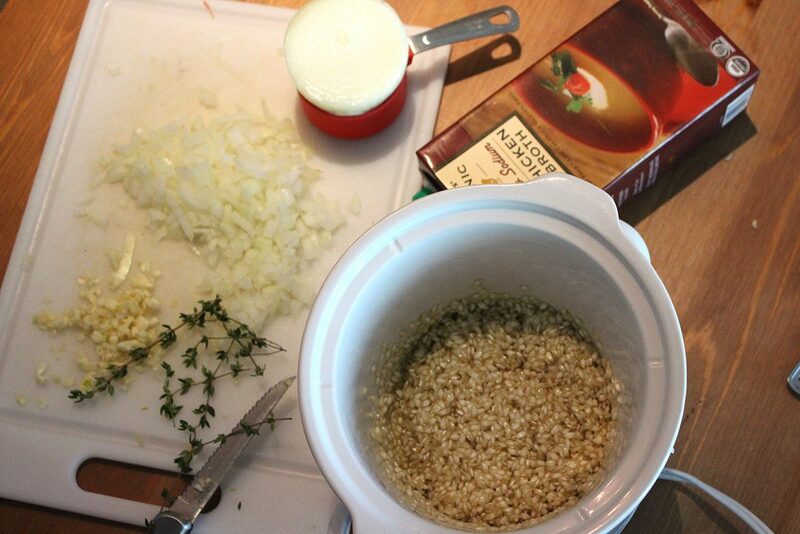 In crockpot ceramic bowl, thoroughly mix arborio rice with 1-1/2 tbs olive oil, salt, and sauteed onions, garlic, and thyme. Add 1/2 c butternut squash (the smaller cubes), then add 4 c of vegetable or chicken stock. Give it a quick mix. Turn the crockpot to high and let cook for 2-1/2 to 3 hours. Occasional stirring is optional---after all, it's a crockpot recipe! While risotto is cooking, sautee remaining butternut squash and mushrooms in ~1tbs olive oil with a few sticks of thyme, until squash has softened. The mushrooms become ready faster than the squash--I suggest either sauteeing separately, or starting with squash prior to adding the mushrooms. 5-7 minutes. Set aside. When risotto is ready and has absorbed the broth, mix in 2/3 c parmesan cheese with warmed heavy cream. 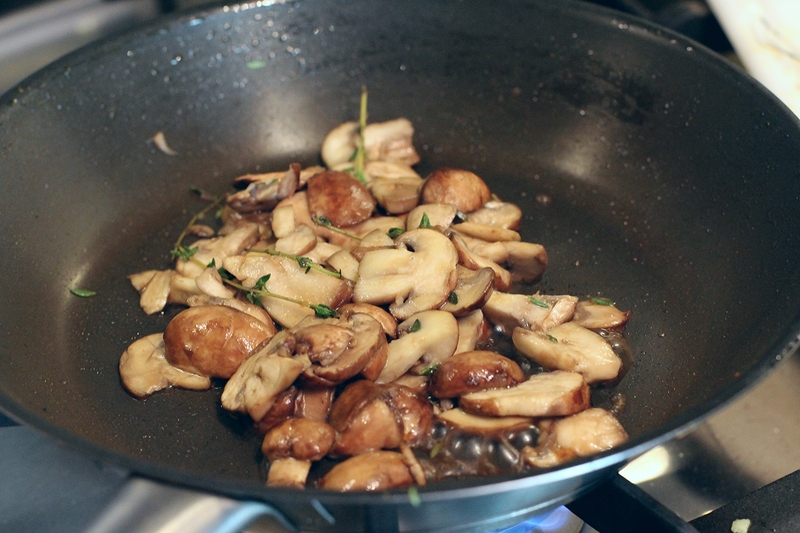 Carefully fold in sauteed squash and mushrooms. 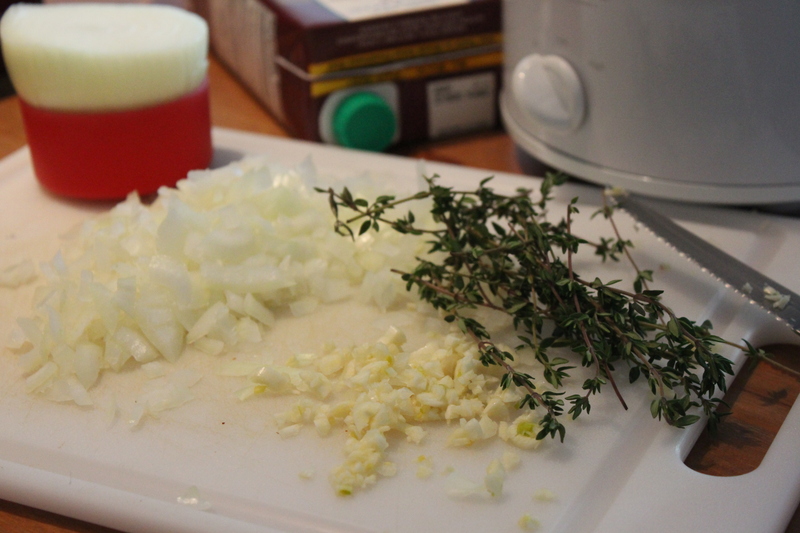 Serve warm with a fresh thyme sprig as garnish. Stirring is optional, but I gave the risotto a quick turn every 60-90 minutes. 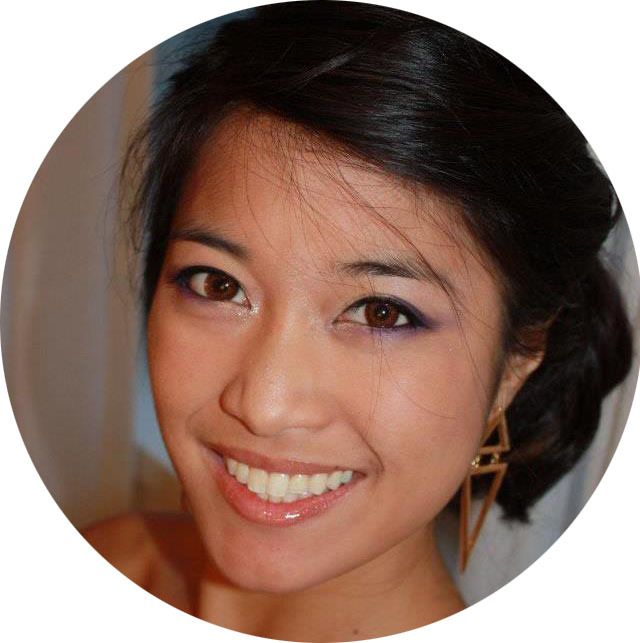 Find and follow me on bloglovin’ —it’s a great way to get a consolidated “smart feed” of all the blogs you know and love, and it’s also an outlet for finding new ones to enjoy!